How Modern Virtual Prototyping Can Change The Product Development Process? Outdated workflows limit team collaboration and compromise design integrity causing failures in physical prototypes or production impacting the schedules of an organization. As a result, leading companies have moved away from a linear process to a parallel design environment, in which design faithfulness is maintained throughout the workflow. By collaborating over a shared virtual prototype, optical and mechanical engineers can easily identify and correct design errors early in the design phase. Having the product designed right in the early stage leads to higher top-line revenue, lower cost, and a faster time to market. 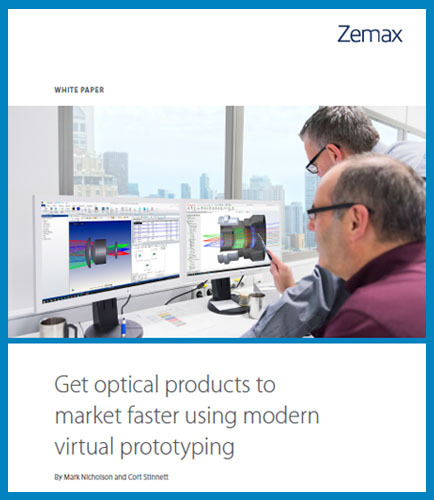 By harnessing the power of OpticStudio and LensMechanix, optical and mechanical engineers can share complete design data and analyze optical performance in a virtual model, reducing design iterations and physical prototypes—saving time and money. Move ahead and read the following whitepaper that will address all your questions, including these: How outdated workflows limit team collaboration and cause design delays?​ What is the importance of modern virtual prototyping?​ How OpticStudio and LensMechanix together can create a modern virtual prototyping solution?